coldantlerfarm: Beginner Beekeeping Class with Zan Asha! Beginner Beekeeping Class with Zan Asha! I am thrilled to announce that Cold Antler Farm will be hosting a stop on Zan Asha's tour! Come and meet the gyspy herself while learning about beekeeping in all its modern and folk traditions. The workshop will be here at Cold Antler and take place Saturday, May 30th. Here is a desciprtion of what will be covered from 10AM - 4PM here at the farm! There will be an hour break for a packed lunch and I'll be happy to show you around Cold Antler, my own hive of bees, and perhaps you can see this amazing vagabond with Merlin. Zan is a woman who belongs beside a horse. I can surely relate. 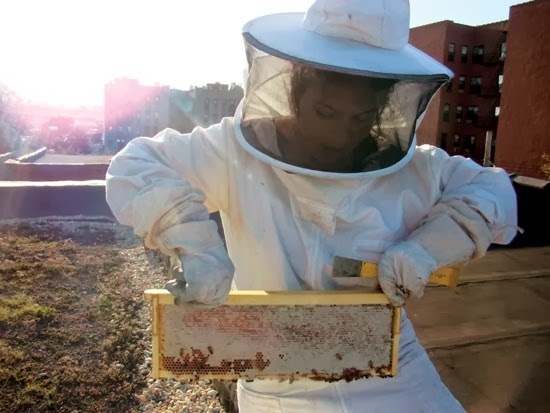 Zan Asha is a third generation beekeeping who practices the same chemical free, behavor-based beekeeping as her grandfather in WWII era Hungary. The practice of watching the very specific behaviors and structures of the bees, and caring for them during the seasons will be discussed, along with the basic principles, equipment, disease prevention, and bee society will be discussed. You will leave with a working knowledge of how to set up your bees and what to expect the first year of beekeeping. Old stories on European beekeeping will be touched on. To SIGN UP please email me at jenna@itsafarwalk.com for details. Price is $100. First come, first served! Zan Asha is a dreamer, just like you. After earning a degree at NYU's Tisch School of the arts, and running an ethnic dance and theater troupe for 5 years in New York City, she changed her focus to sustainability after the recession of 2008. In 2010 She organized a congress of online farmers and sustainability advocates to offer advice and stories of self-reliant skills; The Renegade Farmer was named one of the top 50 Farm Blogs by Seaman's. She also began teaching her grandfather's WWII era natural beekeeping beekeeping in alliance with her landlady, a well known city environmentalist. The chemical free, behavioral-based European style beekeeping has been featured in the film "Queen Of The Sun" and the urban rooftop aspect (she kept 9 hives in the Bronx) was featured in GRIT magazine and MaryJane's Farm Magazine. By request, she slowly began teaching this sought after bee-and-farm knowledge throughout New York, New Jersey, Illinois, Iowa, and Kansas. In the meantime—ever the artist—she focused on her childhood love of painting and fables and creates one of a kind wooden creations and art dolls, which have been featured in PRIMS magazine (2011 and 2012). as well as creating a line of organic, herbal soaps and beauty care products. Her traveling continues, and you can find her adventures currently documented at www.beyondvagabond.com with an upcoming book in the works. Overall, Zan advocates extraordinary living for all individuals. You can also see a compilation of her two year journey here. Thank you so much for doing this Jenna. I'm really looking forward to teaching my grandfather's WWII era, chemical free folk style beekeeping! If I wasn't moving that day I'd be in.